This Giving Tuesday, you can make a tangible difference for Kings County Tennis League. Through the end of 2015, we are looking for your support on three key goals. Read on to learn how you can be a part of our victory. Establish two new sites. KCTL wants to grow its program to sixth and seventh locations in 2016. Each expansion costs $10,000 and we don't want to cut corners! Renovate a tennis court. We'd like to renovate one of our existing locations— a dilapidated tennis court right in the middle of Sumner Houses in Bed-Stuy, Brooklyn— with a new surface and an actual net. This $20,000 renovation will ensure that children at Sumner Houses have a safe place to play and learn. Educate through new, non-tennis experiences. After taking the kids to Google earlier this year, we have a trip planned to an actual sneaker factory in Manhattan, but we need your help to raise $1,000 to fund it. Students will learn how a sneaker is actually made, see what it takes to run and operate a production schedule, and explore the path to entrepreneurship. Click here to make your tax-deductible contribution! This week, we catch up with Renata Thakurdyal, Tompkins Site Coordinator. A first-generation American born in Queens to Guyanese parents, Renata started playing tennis as a young girl in her own backyard. As she grew up, so did her love for the game. Renata describes tennis as more than just a sport. It brought her motivation, enjoyment, and friendship. And now she hopes to bring those same opportunities every Saturday to KCTL. When did you pick up tennis and why do you continue to play? I started playing tennis at the age of 12 in my middle school backyard where there were five tennis courts. The pull for me was the challenge of a new sport under the boiling sun with awesome new friends. Friendship was a major motivational factor for playing tennis--and wanting to get better. I played every chance I had during the school year and in the summers for no less than seven hours a day, for many years. I still continue to play because I love to be active and tennis is in my blood, swinging the racquet feels great. Competition is fun, but it is more the body in motion that appeals to me. When did you learn about KCTL and what motivated you to volunteer? I learned about KCTL from a flyer in a coffee/ice cream shop where I was working part-time during the summer of 2014. It was lovely to find a program where I could play tennis with the youth and be a positive influence for them. I have been a literacy educator for many years and used to help with the younger students when I played tennis in high school. I thought this was a great way to be in touch with the sport even more. Plus, I love grassroots initiatives for the youth. What's been your most memorable & best experience with KCTL so far? My most memorable moment with KCTL was the Jamboree of 2014; it got rained out, but we held the ceremony anyway. It was magical to see the coaches from all the sites and so many students come out! One of the participants from Tompkins came running up to me as I was leaving and gave me an extra hug, which was so nice. I knew I definitely wanted to come back for the next season and that Jamboree made the desire concrete. I got to see many of those students from Tompkins again this year which is special. If you could give one piece of advice to the kids, what would it be? Critical advice for all my students: Know your resources. Where you can go to access opportunities and get the information you need. We live in a city brimming with potential and few students gain access because they do not adequately research the possibilities, the best of these are not largely advertised. Knowing your resources puts you in a position to take advantage of opportunities that no one else can tell you about. Listen with an open mind and be tolerant, you will learn. If there was one professional tennis player you could play doubles with, who would it be and why? It'd be awesome to play doubles with Gaël Sébastien Monfils. I love that he is francophone and seems to have a fun personality. He is a dynamic tennis player. I remember watching him play when I was younger and being thrilled. The establishment of Jackie Robinson Tennis Club is one of our proudest accomplishments this year. 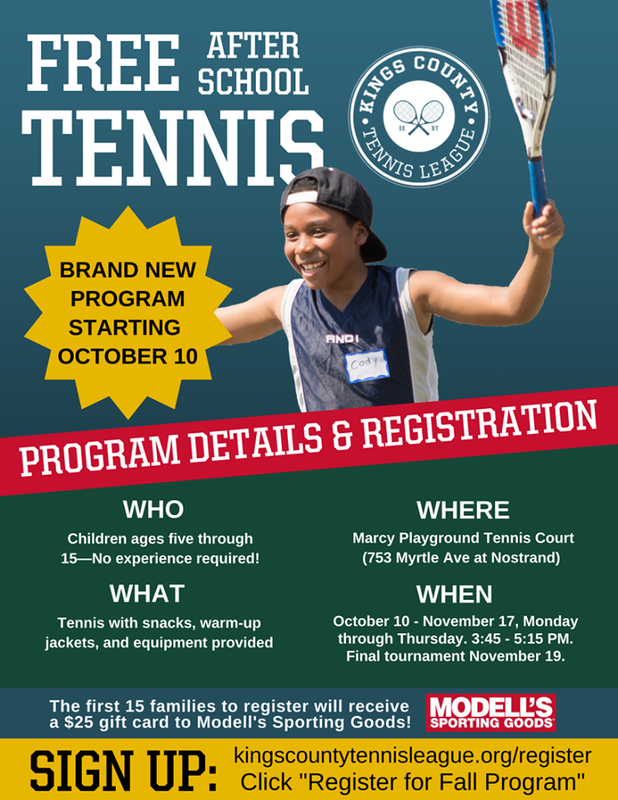 On the tennis courts beside the Brevoort Houses at Jackie Robinson Park, we're providing new opportunities for children and, as a result, providing something new for families. Among those families is a woman named Tiffany Oliver, the devoted mother of two Jackie Robinson students, Aminah and Amaia, who are 11 and eight years old, respectively. Tiffany is pictured here with her two daughters and their father, Jerry. Tiffany stands out as a parent who consistently supports her children from beyond the sidelines, and takes a vested interest in their tennis progress and personal development. She was kind enough to enlighten us on her experiences with Jackie Robinson Tennis Club. How did you and your daughters find out about Kings County Tennis League? We saw flyers in the neighborhood before the season's start. We were immediately intrigued by the opportunity. Prior to joining, had Aminah and Amaia ever played tennis before or did they know about tennis? No, before joining KCTL, Aminah and Amaia had no experience playing tennis. However, they knew about the game and had always expressed an interest in playing because I played during my teenage years. What have Amina and Amaia told you they like best the program? Beyond playing tennis itself--they're most excited by the volunteers that they are working with. They're extremely helpful and friendly. What do you personally like best about it? I'm most pleased by everyone's positive attitudes. Everyone has been extraordinarily welcoming. Do you think they will play again with us next summer? Yes! I would love for the girls to participate again next year and in any other activities KCTL has available. When Bryce Richards discovered KCTL two years ago, he already had plenty to bring to the court: nearly 20 years of tennis experience, high school team leadership experience, and a background in teaching the sport to children. Through his unique journey from Sumner Volunteer to Sumner Site Leader and, now, Lafayette Gardens Site Leader, Bryce's dedication has made a difference for KCTL--but he's always left room for reflection. Read on for some of Bryce's biggest takeaways from our youth tennis program. How and when did you learn about KCTL, and what attracted you to the program? I learned about the program in September 2013, right after I'd moved to New York. I'd just reconnected with a friend who invited me to join, so I volunteered at Sumner a couple times that fall. I loved the idea of bringing tennis directly into the housing projects. I'd never seen anything like that. I also had a lot of fun chatting with the kids; I'd forgotten how much fun it can be to work with kids. What positive changes have you observed in the program over the years? It's definitely become more organized. In 2013, I just showed up at Sumner and started hitting with a couple kids without any instructions or formal training. Last year--during which time I was Site Leader at Sumner--was far more organized, but a couple of things fell through. This year, Meredith's role as Director of Programming has made a huge difference. Case in point: the wonderful Davis Cup we just had. What do you consider the highlight(s) of your experience with KCTL? In early 2015, I took all the kids on a trip to the Google office where I work. I thought I was going to need to memorize all sorts of facts about the company that might bore the kids, but I should have known that a game room, unlimited snacks, and all the silly Google decorations would be more than enough entertainment on their own. I think the kids had a blast. The goal was for them to say to think, "Wow, this is cool, I'd like to work someplace like this when I grow up. So this is why school matters." How and when did you begin playing tennis? I've played tennis for as long as I can remember. My parents took me and my older sister out to the court to feed balls from us when we were three or four years old. Now, with an adult's perspective, I'm so grateful for how much patience and love they showed us by doing that. I really ought to thank them again. How has playing tennis impacted you personally? Tennis has been a part of every stage of my life. Growing up, I played "family tennis"--my mom and me vs. my sister and dad. I played in tournaments as I got older, was captain of the high school team, worked my first job teaching at a tennis camp, played club tennis in college, and met most of my friends through tennis. And continuing to today, KCTL is a big part of my life. That's one of many great things about tennis: it's a lifelong sport. My dad plays all the time, and he's pushing 70. I don't think the same can be said for a sport like rugby. What do you want to see the students at Lafayette Gardens gain from playing tennis this summer? I think KCTL will teach different things to different kids. I think some might learn a lot from the off-courts discussions, information that sticks with them later in life. I still remember some facts and life advice passed down from my mom or dad when I was very young, some of which are quite important! Other kids might benefit more from the tennis instruction, by picking up a sport that they can play for a long time. Learning to lose with dignity is an important life lesson--you do a lot of losing in tennis. This is what I think is great about KCTL. The program provides so many different positive things--formal mentoring in the off-court conversations, informal mentoring in the interaction with volunteers, tennis lessons, and just plain fun--that I think are bound to help these kids. Week 8 Recap from Marcy: Family Day! This past Saturday marked one of the season's most special days: Family Day! Held at each KCTL site, this is a day when students can invite any relative to class--parents, grandparents, siblings, aunts, uncles or cousins--to participate in family-based games and activities. The objective of Family Day is to create a friendly, non-competitive environment for our students and their families to be active together. Marcy certainly had a blast during this especially awesome class. We were pleased to have about 30 children and their family members with us on the tennis courts at Marcy. Everyone remained upbeat and energized thanks to the music blasting from the boombox! Several kids were already out in full force by 12:30 because they were so excited for the class. After stretching and warming up, we played two popular group games: Drop the Racquet and Centipede. Then we broke out into stations for some additional games. The Obstacle Course station had an added twist this week; students had to navigate through the course holding a ball on their racquets. Brave kids were encouraged to try it on one leg! At a Serving station, students and family members practiced serving the ball to each other. This was Marcy's first introduction to serves this season. A lot of students really impressed us at the Targets Station, where they practiced forehands and backhands. Some of the younger, newer children are making tremendous strides in their groundstrokes. We noticed similar progress at the Mini Tennis station, where the kids worked on rallying with one another and keeping the ball in the court. On the big court, students and family members played a game called Balance and Flick the Ball, in which teams pair up, stand three feet apart, and try to flick the ball to each other without letting the racquet drop to the ground. Gary led the off-court discussion on preparation for Davis Cup, scheduled for August 1! Davis Cup is a doubles tournament among all five KCTL sites. Since each site will represent a different country, the day combines competitive play with a lesson in geography. Marcy selected Italy during their off-court session with Gary. We wrapped up with a giant game of Breakout, in which the kids were really pumped to show their family members what they've learned so far this season. Thank you to all parents and relatives who came out to support the kids at Family Day! Hailing from Staten Island, Michele Gee is no stranger to the tennis court. At a very young age, Michele was introduced to the sport by her father, a self-taught tennis player. It soon became the family sport, as her brother would eventually play and compete as well. Being exposed to the game early on and playing throughout her life has lead to unique and unforgettable experiences for Michele, on and off the court. As Jackie Robinson’s first site leader, she brings her experience, aptitude, and passion to the program. We recently sat down with Michele to talk about KCTL and the reasons why she continues to love the game. What attracted you to KCTL specifically? I was initially attracted to KCTL because I just missed being out on the tennis court. I've played tennis my entire life and coached for several years as well and I couldn't help but miss working with children and teaching a sport that had such an incredible impact on my life. But the more I learned about KCTL and its mission to bring tennis--which is still considered an elitist sport--to children in underserved communities, I knew it was something amazing. I also knew that it was something I wanted to be a part of. In your opinion, what's different about KCTL than what you've experienced compared to other organizations? The off-court mentorship portion is the major difference. While tennis is a huge component of this program, it is not the only component. Teaching children about manners, sportsmanship, personal values, and managing emotions is paramount when it comes to their development. I find that the children are just as engaged during the off-court discussions as they are during any of the super fun tennis games that we play such as Breakout and Alligator. How did tennis influence you during your childhood? Tennis had a huge influence on my childhood and, ultimately, my life. My father, a South Carolina native who was raised in a poverty-stricken home, taught himself to play at the age of 10. He didn't realize it, but the choice he made to pick up a racquet would change his life and the lives of his children that would be born decades later. He taught my brother and I to play and, before we knew it, we were practicing every day and traveling to compete in tournaments every week. Tennis gave me an opportunity to travel to places I never thought I could go and to meet the most interesting people. It gave me confidence and taught me the value of hard work. Tennis allowed me to attend and graduate from Howard University on a full athletic scholarship. More importantly, tennis has given me the opportunity to work and mentor children while passing along all the wisdom and lessons that this great sport has taught me. What's the absolute one thing that you want the kids to take away this summer? The notion that they can achieve anything. When a child who has been struggling to hit a forehand finally hits a perfect shot over the net, there is no greater feeling. I watch as their face lights up and I feel a sense of joy because that child now knows that no matter how many times they failed at hitting a forehand in the past, success is possible. And success breeds confidence. I want the students to be confident in their ability to persevere no matter how difficult the task. If you could choose to meet one tennis player throughout history, who would it be and why? I would meet Althea Gibson. I'd ask her how she was able to rise from the destitute Harlem neighborhood where she was raised to center court at Wimbledon. I'd ask her how she survived the terrible racism that she had to endure with such grace and dignity. And lastly, I would want to thank her for paving the way for players like Serena Williams and Lori McNeil, and even a young African-American girl from Staten Island, like myself. Gloria Dorsey is the proud and supportive mother of nine-year-old Julius Dorsey, a student at KCTL’s Lafayette Gardens Tennis Club. KCTL parents like Gloria are a vital component of our program's mission to empower Brooklyn families and build community. Gloria is one of several KCTL parents/guardians who comprise the KCTLPA (Kings County Tennis League Parents Association), a committee that aims to increase student enrollment, achieve student retention, and maintain a parent support system. We recently spoke with Gloria to feature a parent's perspective in the #IServeBecause series. As you’ll learn below, she and her son are longstanding, committed KCTL participants. How long has your son, Julius, been a student with Kings County Tennis League? Julius has been playing with KCTL since 2012, which makes four years including the 2015 season. How did you and Julius learn about the program? A teacher at Julius’ former school—PS 270—passed along a flyer to us in the spring of 2012. We were delighted to learn about the opportunity. Prior to joining, did your son play tennis (or know about tennis)? No. Julius had never played tennis before, but he knew about the game from watching tennis tournaments with me on television. Based on what Julius has told you, what does he like most about KCTL? Above all, Julius enjoys meeting other kids and making new friends. He likes learning a new sport, too. The volunteers are very nice and friendly, and he enjoys their lessons and group discussions. It’s a free opportunity for my son to learn something new! I love watching him learn how to play the game on Saturday afternoons. Meanwhile, I’m able to relax in the park and meet other parents in the community with similar interests as me. I also like how nice the volunteers have proven to be working with my son and the other children. I think KCTL is helping our kids to develop their skills physically, mentally, and morally. I never had the opportunity as a child to learn how to play tennis, so I'm very happy that KCTL is giving our son the chance to learn how to play this type of sport. My family has experienced many good things as a result of this program. There’s a new team on the court: Jackie Robinson Tennis Club. Watch out, Marcy, Tompkins, Lafayette Gardens and Sumner; you’ve got new competition in this year’s Jamboree! Joining KCTL as the program’s fifth team, Jackie Robinson Tennis Club will serve the youth residents of Bed-Stuy’s Breevort Houses – literally in their backyard – at Jackie Robinson Park (341 Malcolm X Blvd). A NYC Parks Department facility, Jackie Robinson Park hosts four hard-surface tennis courts in excellent condition. The site’s youth athletes will represent their team in gray jerseys designed to resemble the Brooklyn Dodgers uniform worn by the park’s namesake. Jackie Robinson Tennis Club is KCTL’s first site addition in three years; previously, Sumner Tennis Club, established in 2012, was the newest team. Located in southern Bed-Stuy a considerable distance from the other four teams’ sites, Jackie Robinson and the Brevoort Houses symbolize great progress in KCTL’s vision of all kids in Brooklyn enjoying regular access to tennis. If you are the parent of a child living in the Brevoort Houses and would like to enroll your child in our weekly tennis program, please fill out our signup form. As part of the U.S. Dept. of Housing and Urban Development's Father Day Initiative, Van Dyke Community Center and NYCHA held a Father's day event on Saturday, June 15. KCTL set up a 10 and Under net in front of the Van Dyke Community Center in Brownsville, Brooklyn. Our "tennis court" was right next to a moon bounce, and the kids still couldn't resist playing tennis! We were out there from 11am to 3pm and had about 25-30 kids stop by and play! HUD's Father's Day Initiative is to show an "ongoing commitment to improving the quality of life for children and encouraging fathers to be responsible."